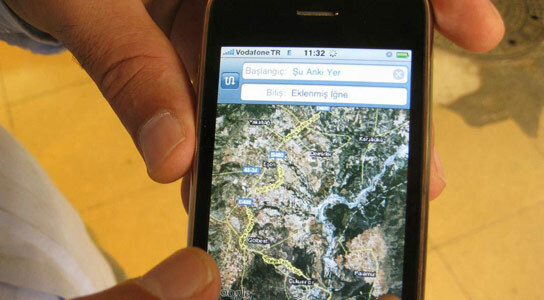 After having been deemed unsafe by the Australian government a couple of weeks back, iPhone users now have access to Google Maps and it hasn’t come soon enough, as a new study indicates that Apple Maps is three times more likely to give you false directions than Google Maps. CrowdFlower related their findings yesterday, and the company compared Google’s, Bing’s and Apple’s maps performance. 1,000 business listings were picked randomly in the USA and another 100 in the UK. For each listing, the goal was to look for two things: whether it could be found on any of the three mapping services, and if the addresses were found, were the results accurate. Percentage of listings found in US & UK. 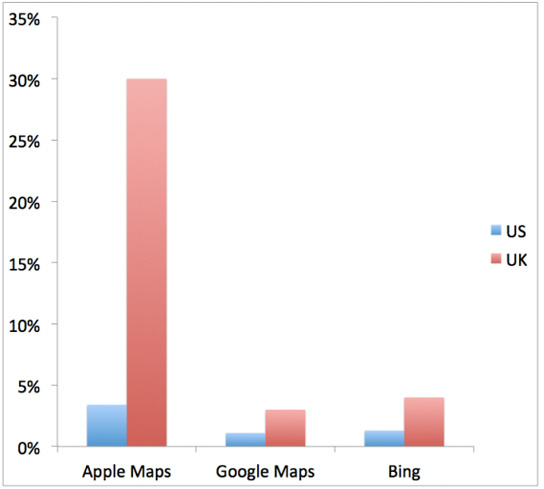 Apple’s performance was the worst of the three mapping services, with only 75% of the listings found in the USA, and 50% missing in the UK. Of the ones it found in the UK, one third of the listings were inaccurately placed, making Apple Maps almost unusable. In the USA, Apple Maps gets the location wrong 3.4% of the time. Google’s error rate is 1.1% and Bing’s is 1.3%. The Apple Maps fiasco has already led to the firing of one executive, and since Google Maps has been available again for iOS users, activations are up again. Percentage of listings found that was incorrect. 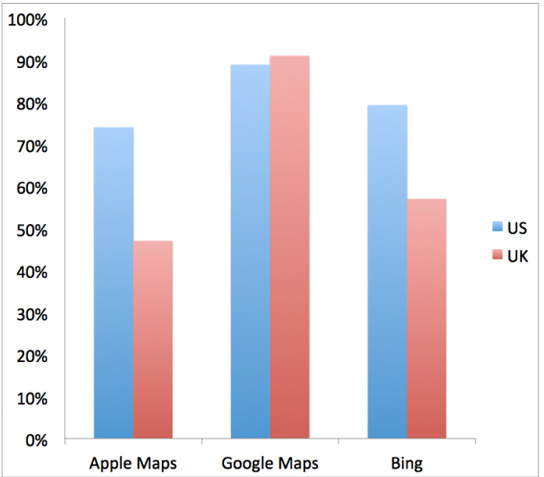 Be the first to comment on "Apple Maps – 3 Times More Likely to Get You Lost Than Google"